Eating eggs creeps me out a little (a lot) but I find them hard to give up. I do not like that good eggs must come from young hens and that old hens are essentially inedible and useless as far as farmers and consumers are concerned. Also, raising male chickens is a waste of resources for farmers (feeding them and housing them costs money that is not made back) so methods have been developed for figuring out from an early age if baby chick are male or female enabling the male chicks to be killed (also called culling) ASAP. Tell me that is not awful. Humans are so selfish. The whole egg industry bothers me. Also, the weird red spots that sometimes show up in eggs, and also that little jelly thing that connects the yolk to the egg white, gives me the heebie jeebies. That was probably not the best lead in for an egg salad sandwich recipe, but despite my reservations, I still use eggs fairly frequently, about a dozen a month, and I adore egg salad. My love of egg salad has only grown over the years as I have played around with different ways of cooking the eggs, since I have switched to free-run eggs and after testing different combinations of ingredients. My favorite way to prepare the eggs is to medium-boil them, so the egg yolk is just set; not runny, but not hard. It is an impossibly fine line to straddle, especially when there is a shell shielding the yolk from your prying eyes. Nonetheless, every time I boil an egg I try to reach that perfect point, sometimes I succeed but more often I fail. The most consistent method I have found for cooking eggs to my liking is to first bring a pot of water to a gentle boil. Then, I gently add the eggs to the water for a very precise amount of time (6 or 7 minutes for a large egg). I used to religiously follow Heidi Swanson's method, which was perfectly satisfactory, but I prefer my eggs cooked just a little less than she recommends. Also, I find her method is not idiot proof - in her recipe she adds the eggs to cold water, puts them on the stove, brings the water to boil, covers the eggs and takes them off of the heat and lets them sit untouched for 7 minutes in the hot water. Since different pots, heating elements and starting water temperatures all influence how long it takes water to boil, it can be difficult to get consistent results. Also, sometimes I wander away from the kitchen while I am cooking; if the eggs are in the water and the water starts to boil I have no way of judging how much longer I should let the eggs cook. I discovered my new favourite recipe for egg salad by accident one day when I was all out of mayonnaise. I am not a big fan of mayonnaise and have tried different things to replace it in egg salad. I have tried yoghurt, sour cream and canola based-mayonnaise; although I want to love egg salad made with yoghurt, I just do not. One day when I wanted to make egg salad, no mayonnaise or yoghurt on hand, I was searching through my cupboards when it occurred to me that mayonnaise is simply made of egg yolks and oil. I thought that if I cooked my eggs to have semi-soft yolks and I stirred olive oil into the mashed eggs, I would essentially have mayonnaise in my egg salad sandwich. I found that stirring in just a little bit of high quality olive oil and dijon mustard into some almost-soft boiled eggs resulted in a perfectly soft and delicious egg salad. I wanted today's egg salad sandwich to be sophisticated (at least more so than it would be with pickles and lettuce) so I set out by first making a home-made rye bread. I mixed the dough together at lunch using cold water and let the dough rise until I made it home in the evening. As soon as I got home I shaped the dough into baguettes and let it rise for about 30 minutes before baking. To add the essential crunch factor to my egg salad sandwiches I used thinly sliced french radishes picked fresh from my community garden plot. To add extra flavour to the sandwiches I slathered the bread with a pesto made fresh from the leaves of the french radishes. I found the radish leaves had a surprisingly strong and peppery flavour that stood out boldly against my home-made rye bread and complimented the simple egg salad. Overall I was pretty happy with this super sophisticated egg salad sandwich. Prepare the bread dough in advance - make the dough the night before, in the morning or at lunch (depending on when you want to bake it) and store the dough in a cool place until you are ready to bake (and make the egg salad). 1. Mix together the water (cold if you are preparing well in advance, warm if you only want to rise for 2 hours before baking) with the water and sugar. Let stand five minutes then stir in the remaining ingredients. 2. Knead the dough for about 10 minutes until you have a smooth and sticky ball. 3. Place the dough in a coverd bowl or container and let rise until you are ready to bake. If you are doing a long rise, leave it in a cool place. For a quicker rise, leave it in a warm place. If you are preparing the dough the night before, store it in the fridge then take it out of the fridge in the morning or at least an hour before the second rise step. 5. Place a peice of parchment paper on a baking sheet. 6. Shape the dough into a baguette and place on the baking sheet. 7. Cover (with a towel or a greased plastic sheet - if you dont grease it, it could stick to your dough, causing it to pull on and deflate your dough when you try to remove it) and let rise 30 - 40 minutes. 8. Remove the cover and place the dough in the oven to bake for 30 minutes. 9. Meanwhile, bring a pot of water to a gentle boil on the stove. Have enough water in the pot so that there will be an inch or two of water above the eggs. 10. Very gently place the eggs in the water (I use tongs to do this) and boil eggs for 6 or 7 minutes. 11. Using tongs, remove the eggs from the water and place them in an ice bath for at least 5 minutes. 12. Peel the eggs, rinse to remove any shell pieces then place in a bowl and mash with a fork (or slice into pieces with a knife). Stir in the olive oil, dijon and sea salt. 13. Remove bread from oven. 14. While the bread cools, make pesto by combining radish leaves, parmesan, olive oil and nuts in a food processor. 15. Slice the rye bread into 2 cm slices. 16. 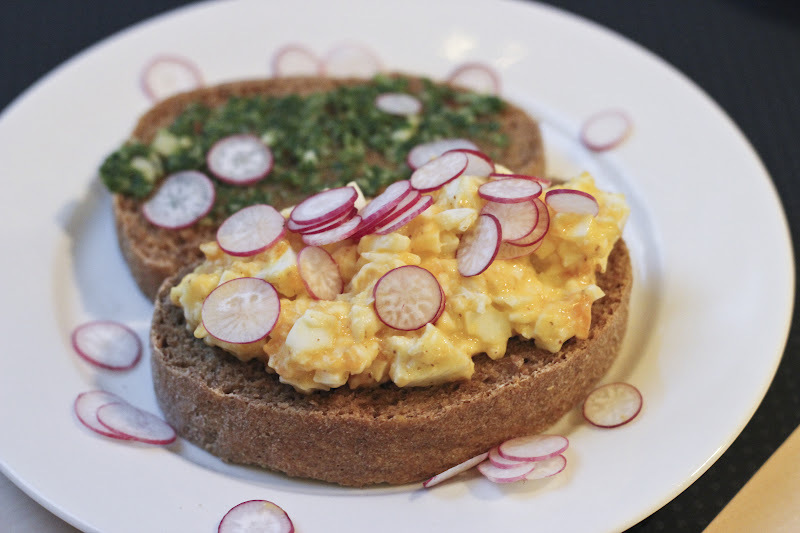 To enjoy as open-faced egg salad sandwiches, slather each slice of bread with pesto, top with egg salad and finish with thinly sliced radishes.